I really didn’t know whether I would make more pompoms when I tried the flowers, but since I made the animals I suddenly have so many ideas and now can’t wait to make more pompoms! All my to-do lists have floated out of the window. I seem to have been bitten by a pompom bug (pompom bug! Hey that’s another idea). 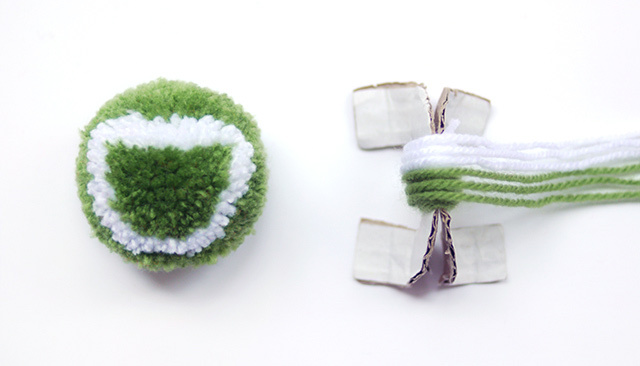 I wanted to try ABC pompoms because, then I have an excuse to make 26 pompoms! I just completed all 26 letters for the 3D alphabet templates which was a bit time-consuming so I came to my senses and tried a few letters only. Well, about fourteen. I’ll try to explain the principal as much as I can, although I can’t explain every single letter I’m hoping you can try some and improvise. As with the previous tutorials, you wrap yarns in layers to reveal symmetrical designs. This is fine for all the symmetrical letters. For non-symmetrical ones like F, S etc, I came up with a new way using two different halves. Start by drawing a letter and draw a line through the middle so it’s symmetrical on both sides. Turn letters like C,D, E etc by 90 degrees, or for L by 45 degrees for this symmetry as you see in my crappy drawings above. 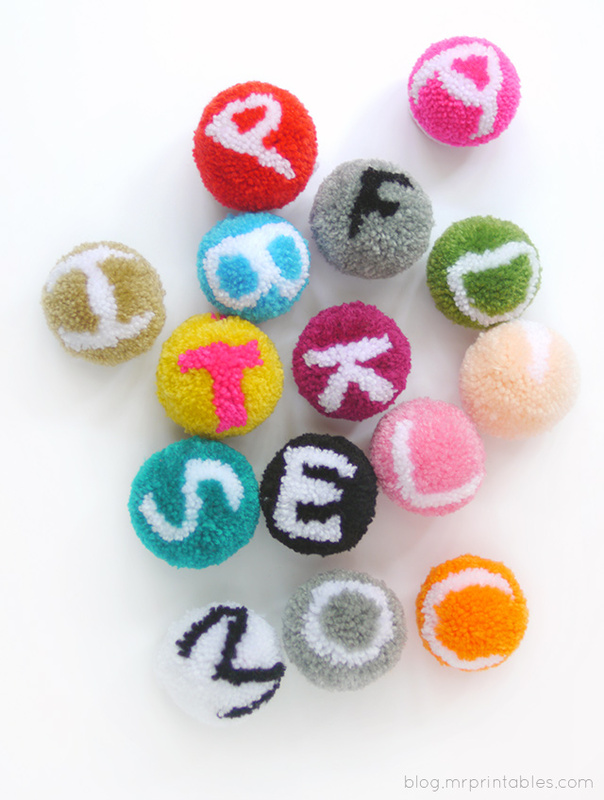 Alphabet pompoms are a bit trickier than the animals ones. 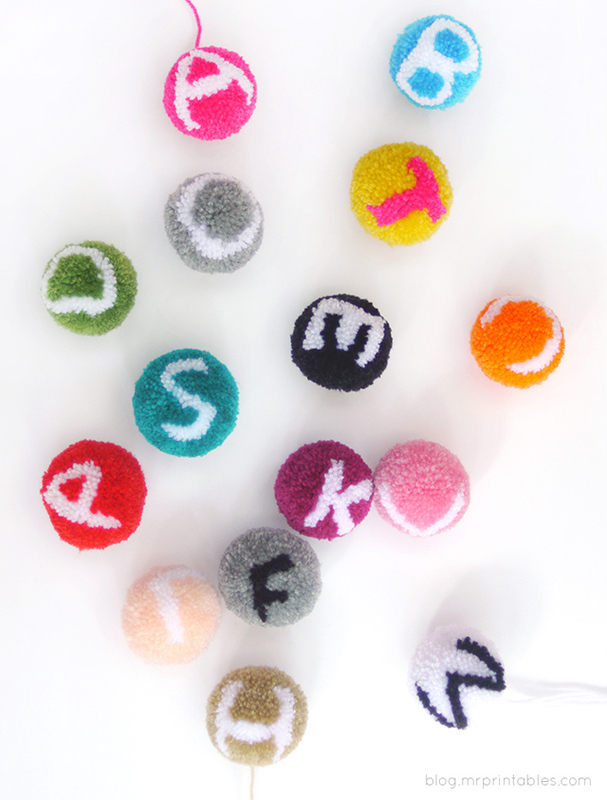 If you haven’t made pompoms before, start with the flowers and animals then move on to the letters. Start from the center. 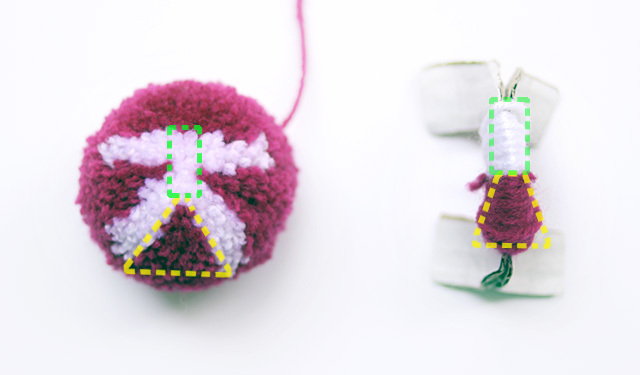 To create the area inside the blue dotted line first, you can wrap the yarn in a corresponding shape as in the pic. 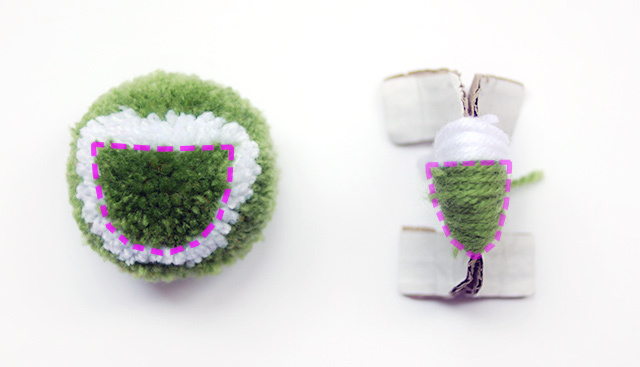 Imagine the shape for your final pompom, but make it narrower as it will expand when you cut it open. The very top is wrapped around only once for the pointy corner. 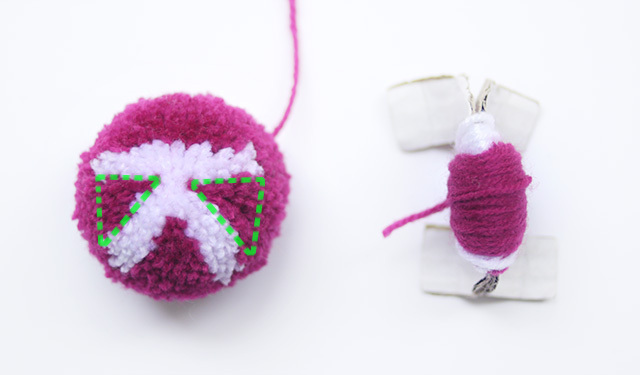 Wrap more yarn gradually towards the bottom to form a triangle shape. Now for the area marked in blue (the side bars of A), wrap all over the triangle. Wrap evenly in 3 or 4 layers. That’s all for the letter A. Now you just need to wrap the background color to completely surround the letter. I’ve made a few more instruction pics below for making other letters. You can then apply these techniques to any letter you want to make. This one shows letter D, but turned around to make it symmetrical. To create straight lines in the letters, like in the D, E, H, T etc, you could prepare 2 different colored yarns as in the pic, hold and wrap them together next to each other. This will help building up the yarn outwards in a straight line and make the area where the 2 colors meet neater. After wrapping for the straight line on the top, continue to fill the rest of the area marked with the pink dotted line with more yarn as shown. Then wrap the sides of this evenly (including the white top part) in white yarn (or whatever color you’re using for the letter) to make the curved line. Finish with the background color. Here’s one more example: K. For this one, you can start with the areas in dotted lines. A bit of even wrapping for the top and a small triangle wrap below. Wrap white yarn over the small triangle part for the diagonal bars marked in green. 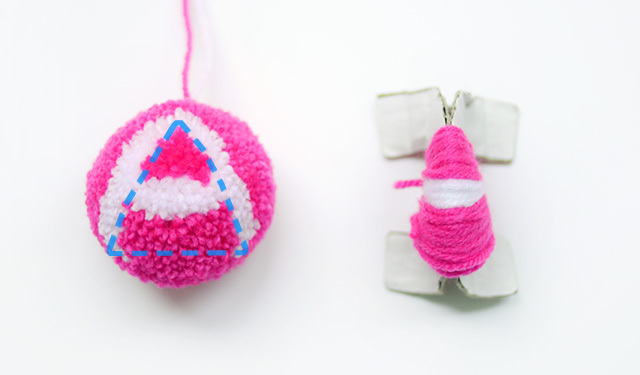 Wrap evenly on top of this triangle shape, which creates a bigger triangle. Now we fill the gap marked in green dotted lines. 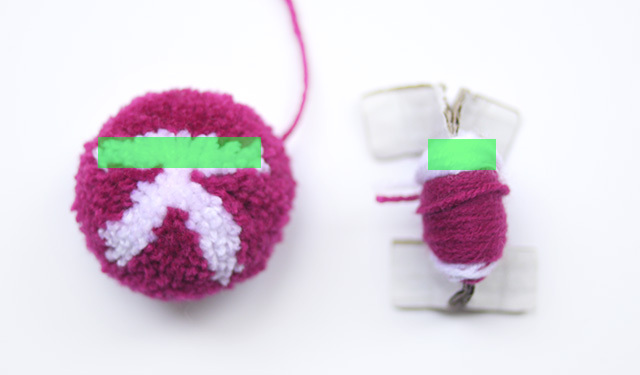 Wrap the background color – more yarn on top and gradually less lower. 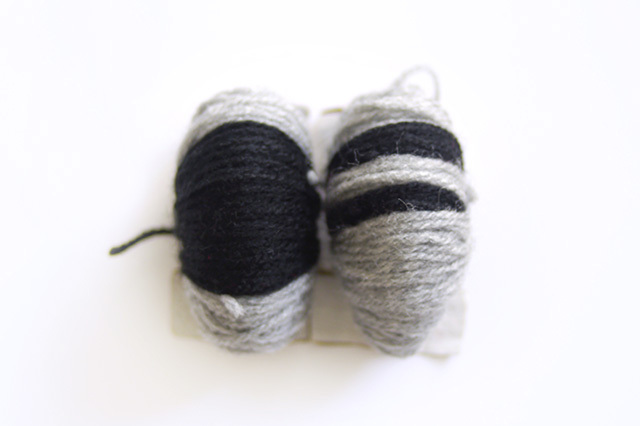 Wrap yarn for the top bar, wrap evenly outwards so you’ll have a straight line later. Finish by wrapping more background color yarn all over. When you make letters including a V shape, like Y, W, M, you can do it by creating a triangle first and then wrapping around it evenly. L is made in the same way as V but with a wider triangle. One more tip is for the non-symmetrical letters like F, P and S that I made. For these, split the letter in two and mirror each part. Here are a few examples explained in diagrams. Sorry for my crappy mouse drawing. This is an example showing two parts for the letter F. You’ll be wrapping the background color first and the letter parts according to the diagram on the outer edge of the pom. When you cut them open those two parts meet at the edge to form a complete letter. You’ll end up with a reversed letter on the other side. 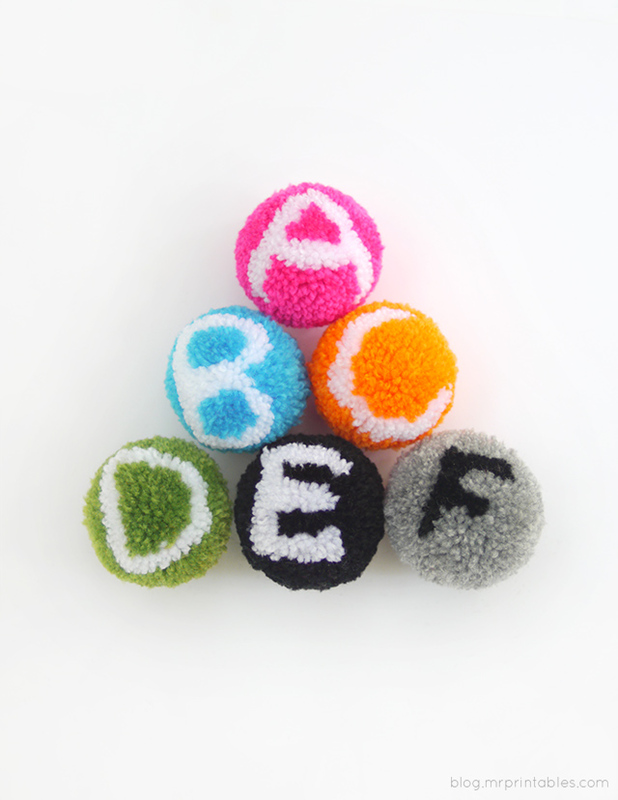 This is sort of the basics of ABC pompoms. There’s limited time and space for me to explain further but hopefully these give you an idea. 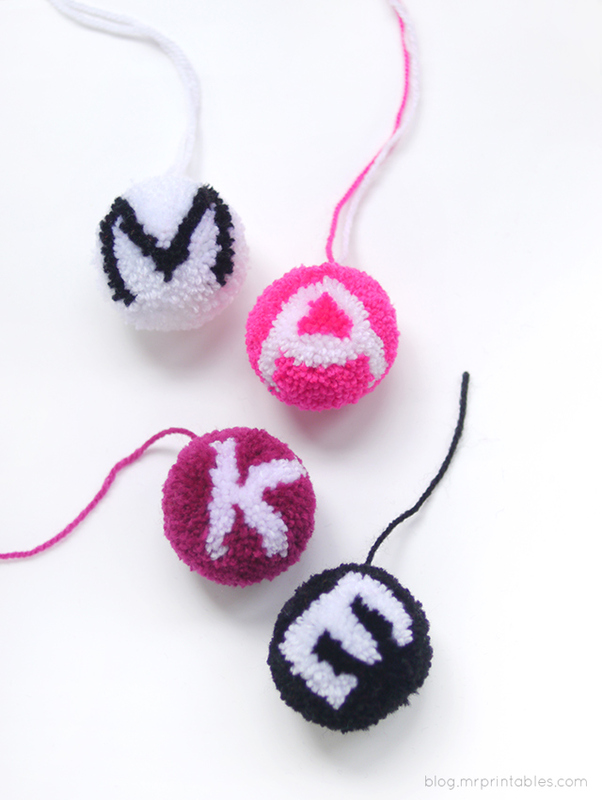 One last thing: when you cut the pompoms open, they will look nothing like the final letters but a mess. Don’t worry and just trim them ruthlessly! I was a bit timid at trimming first but these letters need more vigorous trimming than even the animal ones. Trim them enough so you end up with dense looking balls which will really help with the definition. Also sort out bits that are out of place (they sometimes get twisted inside so kind of comb it through with you fingers). I cut my family’s hair and there’s a worry in the house that I will trim them completely round next time. If you can put up with more pompoms, I have Halloween character pompoms coming up which should be really cute. Maybe you noticed the skull drawing among my letters in the pic above. I do get distracted easily. 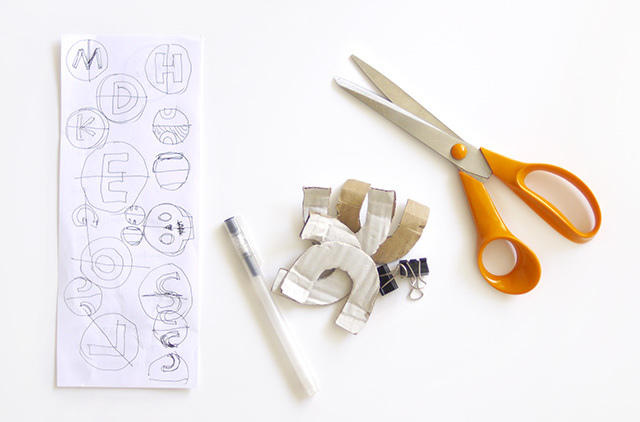 Hope you enjoyed this tutorial.You can make kids names or initials to hang onto their bags and belongings. Even just one letter as a monogram accessary would be cute. I’m really enjoying seeing your creations on instagram recently. Please do share if you make some! OMG!!! this goes under the definition of crazy awesome. Great job ! I’ve linked your post on Facebook. This is absolutely fantastic! And thanks for sharing how to do it. Brilliant. These are INSANE awesome!! I love them!! I made a couple of flower ones, since they seemed easiest! I wish I could sit next to you for a lesson. Going to have to experiment! You are AWESOME!!!!! Thanks for the tutorial. 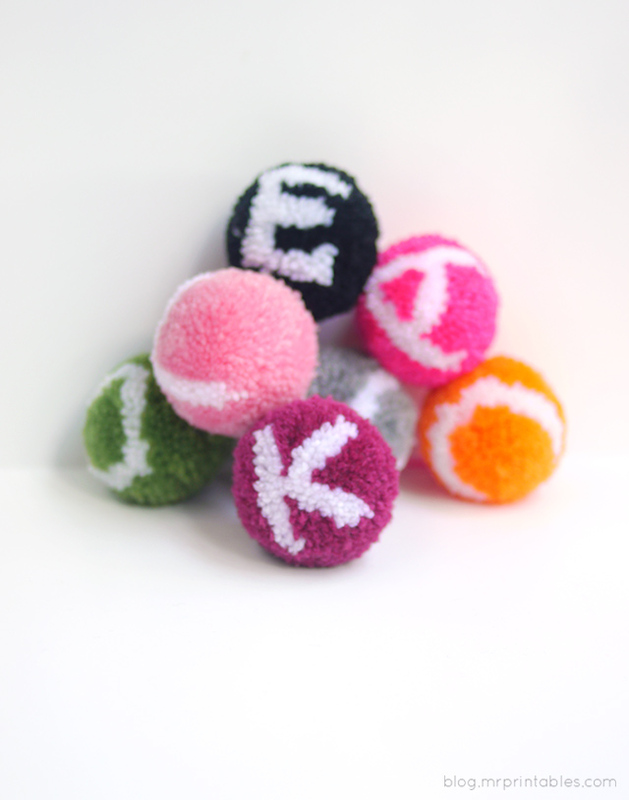 Thank heavens its the weekend and now I can indulge in throwing away my task list and make some pom poms. Wow! This is fantastic! Thanks for sharing the tutorial! I will have to give this a try! Olive I think you are amazing, we simply love all of your printables and other craft & fun ideas. These are great for the gifted learners in my art-integrated classroom! WOW! Thank you! Oh my gosh, I am blown away. I have never seen anything like this before. I cannot believe how your brain works. Never in a million years would I have thought of this. You are amazing. 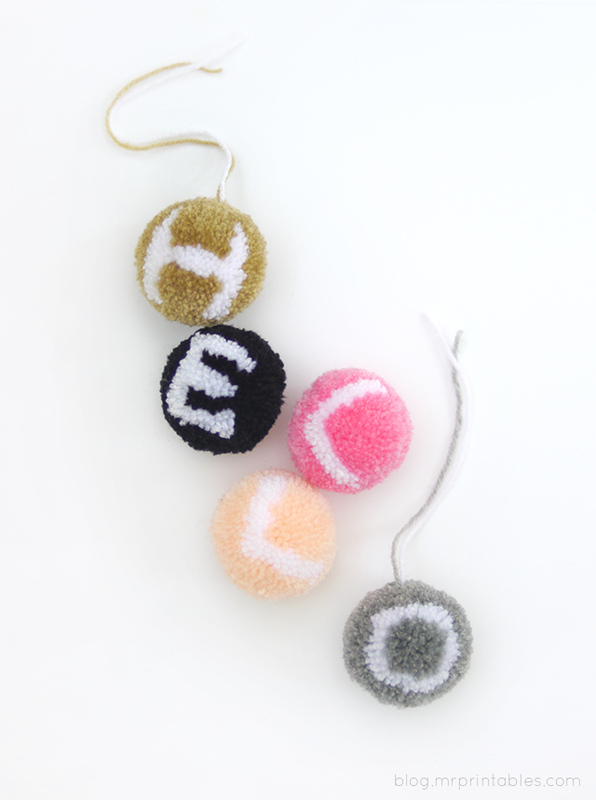 I love these, and as a new knitter, have been looking for projects to use up odds and ends of yarn. I’m having a really hard time wrapping my brain around how these work, but hopefully when I try one it will become clear! Wow so cool but looks really labor intensive! 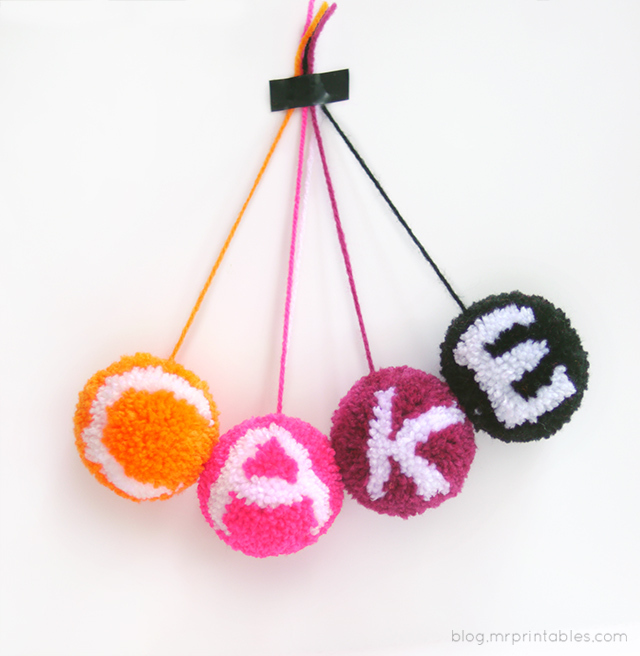 i LOVE these pompom tutorials!! the animals are super cute too! you are so creative! 1. how big are the final pompoms after they are trimmed? 2. is there a type/weight of yarn that works best? thanks for being so darn clever! Hi! 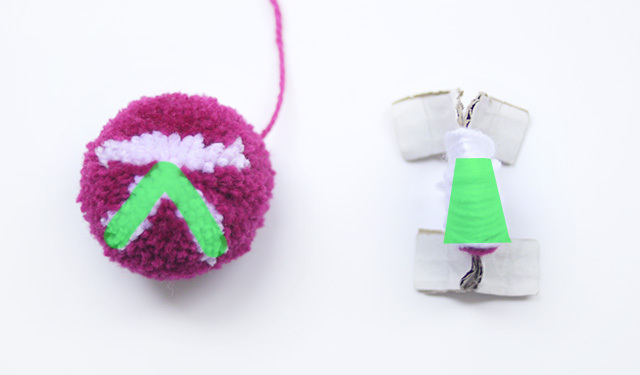 It depends on your pompom maker and how much you trim but mine ended up about 2″ diameter. I used yarn marked as ‘Double Knitting’ but I don’t know much about yarn and I just bought some for the first time to make pompoms. There might be better options..? Hi, I’m Caroline from Belgium. Thank you very much for your tutorial: it’s fantastic! 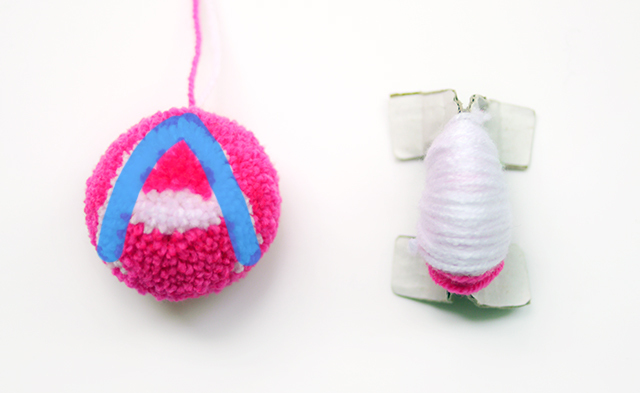 Should we make two pompoms? How to assemble? I would like to “N”, “G”, “R” and “S” … Can you help me? thanks for the tip on yarn type. i saw the car/house post – amazing!!! glad i hadn’t gotten out to get my yarn yet. 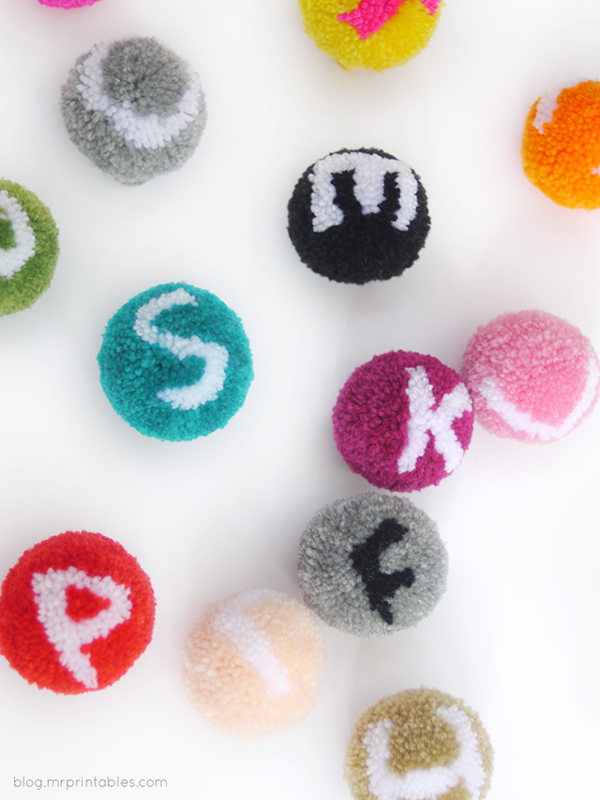 how many letter pompoms would you guess you get out of a ball (or whatever it is yarn comes in is called) of yarn? 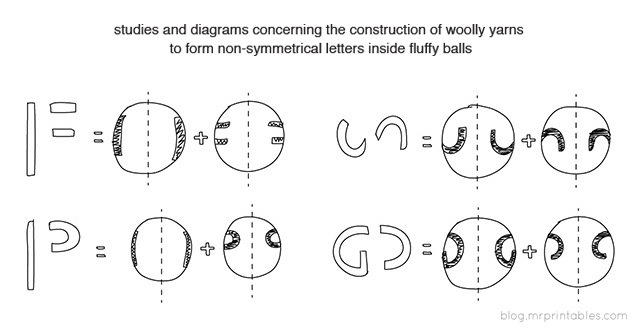 Hi and thanks a lot, I managed to make symmetrical pompoms just fine, but almost went nuts over the letter R… Can you please help me? How do you cut the yarn for do the pompon? I can’t understand 🙁 Please! i’ll be waiting the answer. Thanks! xo! I just love your pompom! it looks adorable! i really want to make some for a friend and I still don’t get how do you do the ‘S’ and also ‘Z’. Hey!! this is awesome! I want to make those pompoms as a gift for a new born, but I don’t understand how to do the N!! Can you help me? How do i make J? Can we make it? Helpp!!!! Hi .. Am wondering how could you make letters like P and N. Could you give diagrams for the same? your steps are easy to follow ,i tried a B and W!! Wow! Those pompoms are amazing! 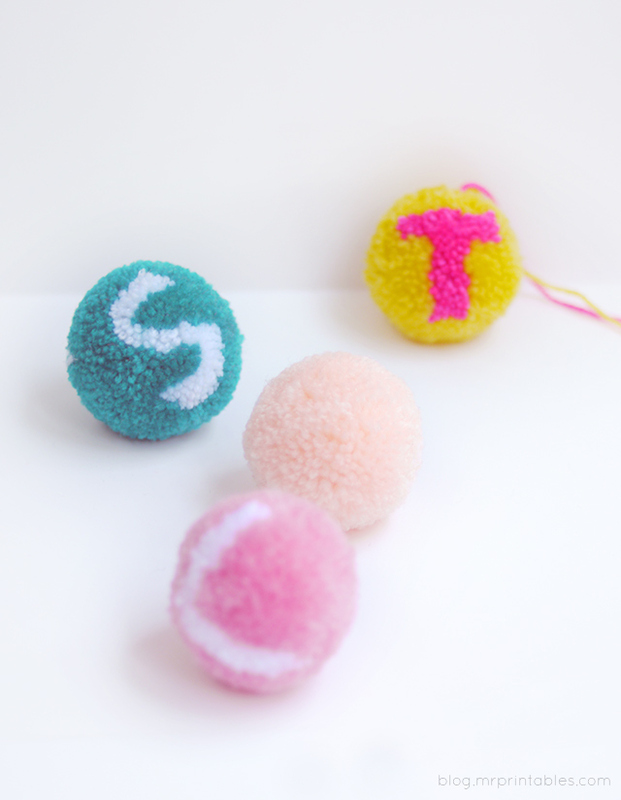 I did make some flower pompoms but I don’t understand how I can make the letter S. Can you please help me?? Thank you. I’m french and I don’t really understand English… It’s too bad… But your pompom are very beautiful, congratulations ! Is it possible?? Do you know how? I love these & am going to make them soon! Hi-I don’t even know how I could ever do these again b/c it uses a different part of my brain I think. :l If you can do the L or F you are almost there. The line across the letter A should help you make a horizontal line (for the 3 lines of an “E”) and a basic line vertically will help you make the vertical line of the “E”. Do a straight line 1st like a “l”. then try to follow the instructions on making a horizontal line and then you just do 3 of them. I can’t stress enough the twisting into shape I did to even lines out. Also, pulling out stray pieces. AND hacking off a lot with trimming scissors. 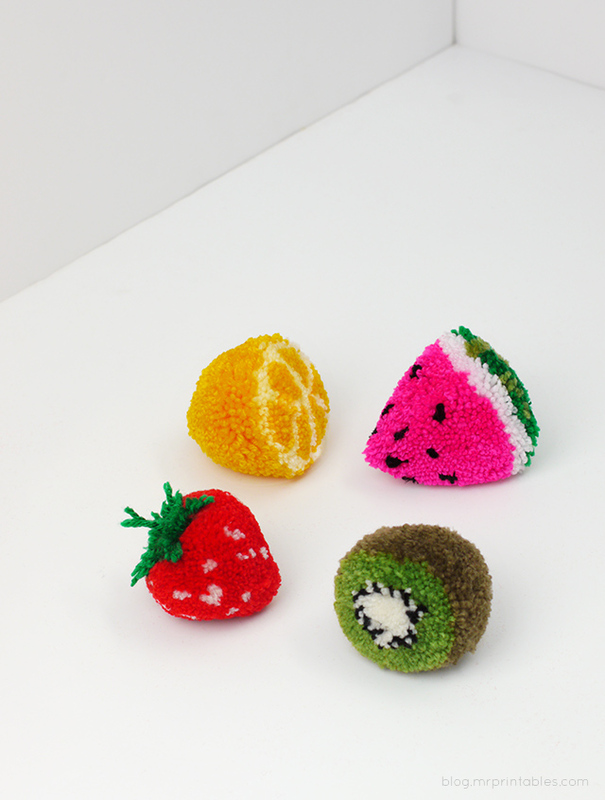 I’m really new to this and I would really like to know if you have the patterns just like how you made the pom pom fruits.Thank you very much. Hi ! This work is ouy of the world !!! 😀 will plzzz share tutorial of all alphabets. I need do make tjem on SUPER UTLRGENT basis. It is possible for u to share with me.??? It will be a HUGE help. My id is kraftipriyanka@gmail.com. OMG! Took me a while to wrap my brain around how to make these. LOVE them! Honestly, I just had to follow the Mr. Printables instructions. Those were the most clear. Start with a straight line first, (or the letter “i”) just to see how things will pan out. One of the most valuable “tricks” was knowing that it really will look awful at first, and almost unrecognizable. Twisting and pulling the letter lines back to shape will also help. Trim SUPER well-just pretend you are Edward Scissorhands! 😉 Then, if there are any stray pieces, just pull them out. Just realize, if it comes off one side, it will come off the other since it is one piece. Also, I did use thin brown twine to tie the center as tightly as possible. The asymmetrical ones will have an icky one on the back. Also, start with an animal. That helped. Good luck! thank you so much for your reply 🙂 actually i really want to make a pom pom rug. i just tried the letter s.. what came up is nothing to an alphabet. the symmetric alphabet is fine. but not the assymetric one. actually for the S i followed as in the diagrams. what i dont understand is the Cardboard. we have 2 sets of C cardboard to use. do i make the exactly same in both cardboard then stick them together? btw how did you manage to make the Z. its not symetric. i just need an S and Z. How do you make the J? I tried to work it out myself but couldn’t! Anyway, yours are incredible! And so colourful! I really haven’t touched these since I first finished them. I would like to re-make some that are not as crisp looking, but it was really all consuming at the time! For the J, I just followed the instructions for the U. I can’t stress enough how you have to pull stray yarn pieces out and generally move around fibers until the right letter shows. Good luck! I trimmed the letter area first, b/c if I truly messed up, then I didn’t have to bother trimming the whole thing. Plus, then I used that as a guide to trim the rest. I used brand new super sharp scissors. I had to keep holding it at eye level and turn to see if it was evenly trimmed. I just can’t wrap my head around these and would really love some for my wedding in September, do you, or could you make them for a fee? or could you do a video so I can follow in real time, Need a ‘G’ and an ‘L’!!! Mr. Printable, I dont know HOW you figured this out,, but you truly ARE a GENIUS!! I am apparently missing the whole section of brain, wherever this type of analytical thinking lives?? Which also means i cant understand knit/crochet patterns and directions, no matter how much i want to be creative in that way!!! 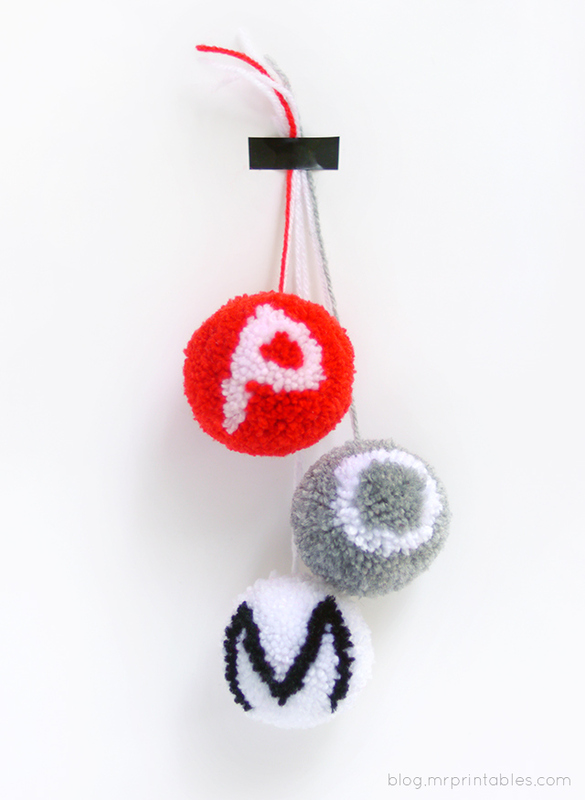 I LOVE ALL of your pom pom creations to pieces, THANK YOU so much for sharing! !